Jim Donovan and Dave "Dino" DeNatale look back at the days following September 11, 2001 as the sports world dealt with the aftermath of the terrorist attacks. Did you see any of Sam Darnold's performance on Monday night in Detroit? He looked good. Real good. The rookie QB from USC bounced back from a pick-6 on his first NFL throw to lead the Jets to a dominating win over the Lions, completing 16 of his next 20 passes for 198 yards and two touchdowns. Is that going to raise the temperature in the Berea pressure cooker to play fellow first round QB Baker Mayfield? I asked Jim Donovan that question on Tuesday's postgame show. Let's put it this way: Tyrod Taylor needs to have a bounce-back game in New Orleans on Sunday. Like really needs it. The Saints defense just got torched by Ryan Fitzpatrick and the Buccaneers to the tune of 417 yards through the air and four touchdowns. So if there was ever an opportunity for Taylor to turn things around, this week seems to be it. Otherwise, next Thursday night when Mr. Darnold comes to Cleveland could be very interesting. I always think of Alan Jackson's remarkable song, "Where were you (When the world stopped turning)" when we hit the anniversary of September 11, 2001. Everyone who was old enough remembers exactly what they were doing when we heard about the horrific attacks against America. From a sports perspective, the immediate aftermath of the terrorist attacks caused Major League Baseball, the National Football League, and NCAA college football to shut down. In fact, most sports were put on hold as we turned our attention to helping those in need, honoring the victims and their families, and figuring out as a nation what happened and what we were going to do about it. Coming soon, I will look back on how a Northeast Ohio community came together thanks to high school football in the days after 9/11. However on Tuesday, I was interested in finding out from Jim Donovan what he remembered when the Browns returned to the field to face the Lions on September 23, 2001. 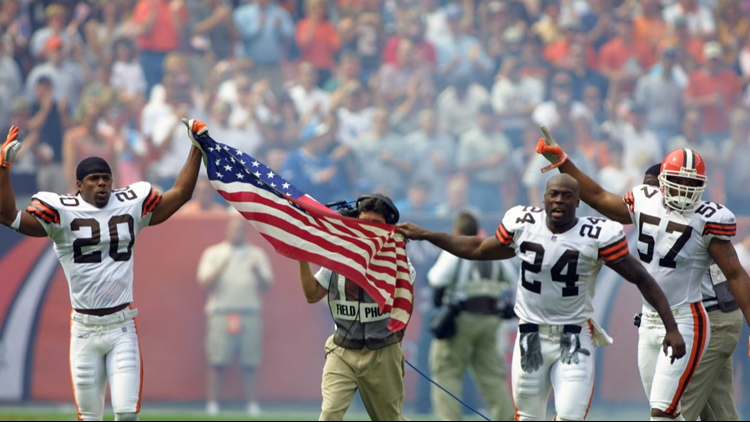 23 Sep 2001: Earl Little #20 and Corey Fuller #24 of the Cleveland Browns take the field with an american flag during pre-game ceremonies at the game against the Detroit Lions at Cleveland Browns Stadium in Cleveland, Ohio. The Browns won 24-14. Jimmy remembered how then-owner Al Lerner worked to make sure that the Browns security was top-notch when the gates of Cleveland Browns Stadium (now FirstEnergy Stadium) re-opened. Lerner, the former Marine who was close to President Bush, was appointed to a committee to try and figure out how to ensure fans would feel safe and secure coming back to sports. Lerner and the Browns put a lot of time and effort in preparation for that first game back. Remember that the head of team security was Lew Merletti, the former head of the U.S. Secret Service. Jimmy recalled how proud the owner was that his franchise became a model for the rest of the NFL in fan safety and security. Sports did indeed come back in the days and weeks after 9/11. That fall, we saw one of the most memorable World Series, highlighted by President Bush throwing out the first pitch in Yankee Stadium. Watch the Donovan Live Postgame Show in the player above.